I love making these shots. Sarah and I were traveling with our guides on our adventure through a village in central Bhutan and we stopped for some water and a little respite from the constantly winding mountain roads. I was getting a bit fidgety because it was only the second day of our Bhutan adventure and I wanted to make a million National Geographic worthy shots. Everything here lent itself to making beautiful images but for some reason I wasn’t getting what I wanted. Then this woman with a prayer wheel came wandering by. 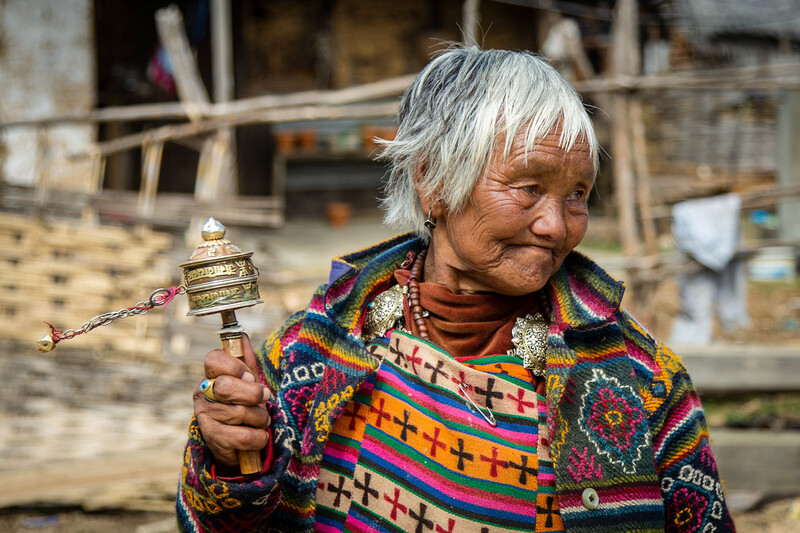 She was just spending her time, as she does every day, walking through the dusty streets piously spinning her prayer wheel but the light in her eyes said she was at least a little excited to be seeing some foreigners admiring her little town. She wasn’t exactly posing but she did make herself available for some good shots. I think the expression on her face pretty much says it all. She helped put me back in the zone. Image made with a Canon EOS 6D 20.2 MP full frame DSLR with theEF24-105mm IS Lens Kit. What a gorgeous shot. I love her expression and the colors as well as the out of focus background. Love your portraits Jon, you always capture the right person in just the right moment. Nice photography. 🙂 Is prayer wheel very famous in there? I am loving so much her expression. Shows like a very good woman. Absolutely wonderful shot indeed! I keep scrolling up and down, eager to put my thoughts into words… I really like the “mood” of the photograph and the “moonily confidence” in her face.